The Port Hawkesbury Civic Centre is a focal point in the region, serving residents, tourists and the business community. It is a state of the art facility offering meeting and conference facilities, including a full conference room (5040 square feet), a 16X30 board room, and classroom space. 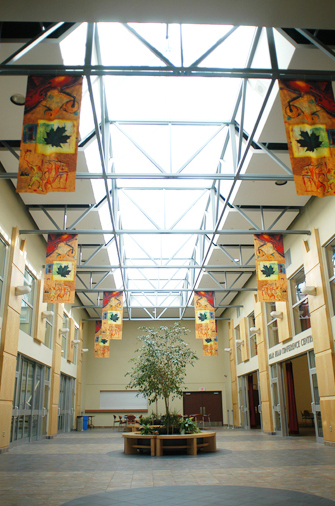 The Civic Centre also houses an arena, fitness centre, dance studio, performance space, the J. Franklin Wright Gallery, municipal offices, racquetball courts, and a walking track. The innovations used in the construction of the Civic Centre makes this truly a "green building" more efficient and easier on the environment and its users. The Civic Centre has a complete package for business needs including LCD , mics, screens and high speed wifi. With catering and kitchen facilities on site, the Port Hawkesbury Civic Centre has everything required for your next meeting, convention, or event. The Arena has 1000 fixed seats with the capacity on the arena floor to host an additional 1000 theatres style, or 700 banquet style. This is an excellent space for trade shows and is the first arena in North America to use engineered natural daylight to illuminate the ice surface. Madison Violet April 26 performance is sold out.